My Brother In Law, Jiggs was always getting into some kind of shennanigins. He liked to drink and raise a little hell at times. Jiggs was always amazing his family with his wild adventures. Once he had been out a good part of the night carousing. My husband and I woke up the next morning to a strange noise, a kind of whirring noise, like a motor of some kind. We followed the noise down the stairs and out the front door. There was Jiggs’ old white plymouth with it’s nose facing our front yard fence, resting there, The motor was whirring up a storm as the car was still on and stuck in the drive position. Jiggs was passed out at the wheel. Nice. He had a couple of drinking buddies in town. One was an old man named Clarence. Clarence’s family were some of the original pioneers in our small town. They were into gold mining from way back. Clarence and his two brothers still lived in their family home. I don’t know if they all left, married and raised families and then moved back, but they were all in their latter years and once again lived together. I had noticed Clarence as he wore a silver hard hat, similar to what miners wear, around town. I also noticed that many mornings in the wee hours, he would have breakfast in the local cafe. He usually looked a bit rough around the edges, possibly hungover from a late night’s bout with the bottle. I thought it odd that he would order Steak and Eggs, with the steak so rare that I could not look at it. Steak tartare anyone for breakfast? Shiver me timbers I say. Jiggs used to like to sit in the tavern with Clarence and listen to his stories about when he worked at the cement plant in our little town. Back in the 60’s the cement plan was a major source of work for the towns’ menfolk. You could count on hearing the “booms” off and on throughout the day as they blasted away with dynamite. The south side of town was always covered with a fine coating of white cement dust, while the north side had less. I imagine the housewives in those days really hated all of the dusting they had to do. Yes, Clarence had some stories, and he and Jiggs drank together and “storied” together. Jiggs would sometimes visit Clarence’s house and they would really tie one on. Clarence would often pass out on his couch while Jiggs was “visiting”. Jiggs rented a spare room at our home back then, so needless to say, he sat at our table for many meals also. One particular day right before Thanksgiving, he had brought me a beautifully fat but frozen turkey to cook for our dinner. It was his contribution to our meal that year. Since money was tight then, I was grateful to have it. I began the preparations for that year’s feast. It would not be a large gathering, just my husband, myself and our little boy and Jiggs and another friend of ours. The night before, Jiggs had mentioned having Clarence come down for Turkey Dinner the next afternoon, and we said “why sure”. I put another place setting on our little dining room table. Nothing matched, but that was ok, the food was smelling great. Clarence appeared and the boys began their talking and lying to one another as men do. I swear there was not even a “fish story” going on out there in the living room, but you would have thought so. They say women get going in their talking, but geez. Finally everything was ready and we all sat down at the table, gave thanks and dove in. Delicious turkey, very moist they all said. Clarence, especially seemed to appreciate a hot meal. It was a pretty nice day all in all. When Clarence turned to leave, he stopped and thanked me for the meal and said it was the most delicious he had had in years. I said, “My pleasure”, and he was gone. I felt pretty good about serving some lonely old guy a Thanksgiving meal. I would have felt much better about it, had I not later learned, that ,that very same moist delicious turkey had been hijacked by Jiggs right from Clarence’s very own freezer! You see Clarence and Jiggs had become drunker than a couple of skunks the night before, and they had both passed out in Clarence’s living room. Jiggs had woke up hours later, very hungry and looked through Clarence’s refrigerator. Nothing to eat there, but in the freezer he spied that frozen turkey. Jiggs being still in a drunken state, grabbed that turkey and brought it home thinking he was going to cook it that night. Of course he passed out in his room and found the defrosting turkey next to him the next morning and Clarence’s boots upon his feet! Mortified that he had stolen his friend’s turkey, he gave it to me and invited Clarence to dinner. Jiggs, being the scoundrel that he was, not only invited his friend to a dinner that he had stolen from him, but also served it to him wearing a pair of his heisted boots also! Awesome and hilarious story! I’m sure it wasn’t as funny when you found out about the turkey at the time, but looking back, it’s definitely a laugh. 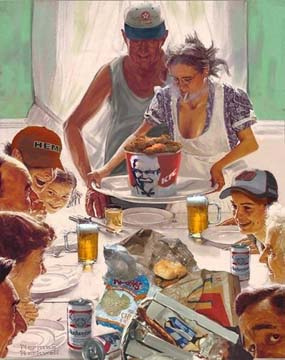 Have fun on your relaxing Thanksgiving day and have a good meal! I did laugh after being shocked. That was many many years ago. My husband said it ha snowed and Jiggs’ footprints went from Clarence’s house to ours, forgot that part. Crazy Jiggs. Bad Jiggs. Happy Thanksgiving Day to you to Emily! Congrats on finishing your college apps. !! LOL that is just too funny, almost as if it were out of a movie – dang there is a movie with that scene in it but it has run from my racing mind! Incredible writing as always huns! Wows! Hey thanks, it is out of a movie, the movie of my life and crazy family! I swear these guys , (my hubby and his bro), did the most outrageous things, even as kids. I would never have dreamed of doing the crazy things they did. I have much story material from those guys alone.